A Deal travel company coach will transport Sheffield United players to their FA Cup semi-final game against Hull City tomorrow. The Bayliss Executive Travel Ltd coach departed from its depot in Deal Business Park in Southwall Road at 9am, this morning. 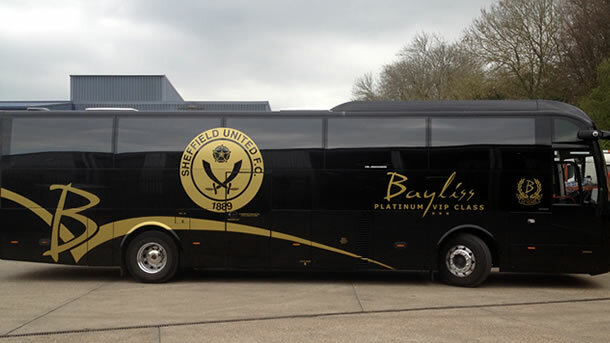 Bayliss assistant manager Rob Marriott is driving the coach to Sheffield United’s grounds Bramall Lane and at 5pm this evening, will drive the players to a secret location in London. Tomorrow morning, the coach will transport the player’s kit, before returning to the secret location and taking the footballers to Wembley Stadium, where the team will play for a place in the cup final. If the team are successful, Bayliss will be provide the transport for the FA Cup final too. 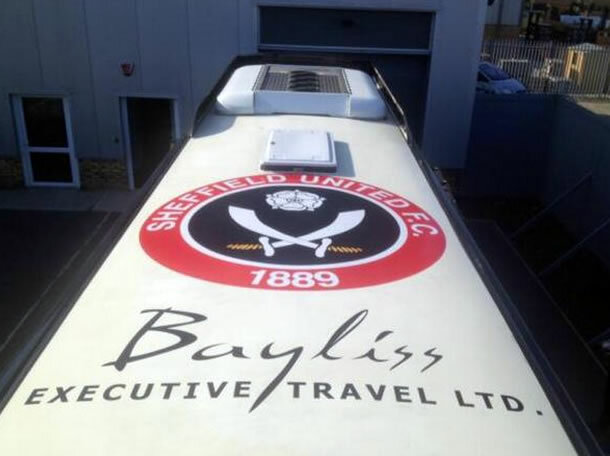 The coach features the football club’s logo on its sides and roof to ensure broadcasters are able to track it. The luxury coach was given to the club as a gesture from managing director Alistair Bayliss, who said that the football club has been nothing but first class to him and his company. Mr Bayliss said: “It’s got a real pedigree. “We hope the players are inspired by the coach and that it makes a little bit of difference on Sunday. “We have a great relationship with a lot of people at the club, going back to when the Blades were sponsored by Visit Malta, who we provide executive travel for in this country. Until recently the coach was used by Glasgow Celtic’s team bus. A photo of the coach was put on Twitter and has been retweeted more than 100 times by players and fans. The Deal based company has 14 coaches and executive vehicles and will soon be celebrating its tenth anniversary.